Rapid industrialization and advanced technological changes have put Indian economy on fast growth. But such developments pose, unprecedented challenges to human society in term of climatic and environmental degradation. Therefore the people and governments have come forward to dealt with environmental threats and also to explore many opportunities so as to address the environmental issues and also to create a sustainable environmental future for all. We at Hero MotoCorp are continuously striving for synergy between technology, system and human resources, to provide products and services, to meet the aspiration of our valued customers that too, demonstrating our "WE CARE" philosophy. While doing so, we maintain the highest standards of ethics and societal responsibility, constantly innovate the products and process and work in partnership with our supply vendors to take the organization to new excellences. We believe that our vendors and dealers are key stakeholders and partners to work towards the goal of sustainable development. Green Vendor Development Programme refers to the way in which organizational innovations in industrial supply chain management may be considered in the context of the environment. Organizations which act proactively not only to identified but also to implement actions in process / operation so as to address environmental issues. 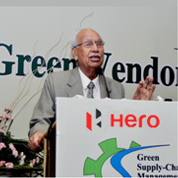 Green Vendor Development Programme (GVDP) encourages a collaborative effort between Hero MotoCorp and its suppliers to achieve Hero MotoCorp's overall corporate environmental goal. GVDP calls for partner companies to demonstrate their commitment towards improved environmental performance and striving for continual improvement. Six pillars have been assigned to GVDP model which are Energy management, Water management, Waste minimization, Prevention of Pollution, Substitution of hazardous chemical and Environmental compliance management. Partner vendors are given specific training on all six pillars of GVDP and mapping of processes/equipments is carried out based on logical analysis so as to identify the gaps or significant environmental aspect and accordingly improvements projects are undertaken for implementation. The programme works on PDCA approach. HMCL also endeavors to provide a platform on which the vendors can share their environment achievements and problems encountered during implementation of the green vendor program. The objective of this meet is to share success stories on environmental improvements that can be replicated at other vendor facilities. This platform lays the foundation for a mutually beneficial eco-future. We understand that environmental protection is our responsibility towards our future generations and thus while providing our customers with supreme quality of products and services it is important for us to ensure that environmental considerations are given utmost importance. We will continue taking initiatives towards environmental protection and base all our business decisions on environmental considerations.